What’s on the cocktail menu for the holidays? Egg nog and sparkling wine are perennial favorites. But offer guests holiday drink menu. Here are some of the beverages we serve, all with a holiday theme. 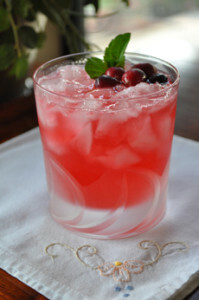 Instead of white wine, make a Cranberry Kir: white wine with a splash of cranberry liqueur. It’s our own adaptation of the popular French drink, Kir (white wine plus blackcurrant liqueur). Instead of plain red wine, make mulled wine with holiday spices. You can serve it warm or chilled. 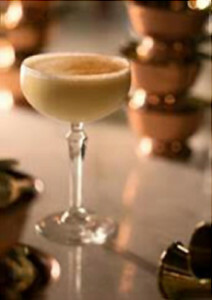 In addition to all kinds of variations on traditional eggnog recipes, there are also eggnog cocktails which have fewer calories than straight eggnog (which is perhaps the most caloric beverage on earth). TOP PHOTO: A cranberry and mint leaf garnish works for any cocktail. Photo courtesy Sarah’s Joy. BOTTOM PHOTO: Egg nog is less caloric in an eggnog cocktail. Photo courtesy Selva Rey Rum. Cranberry liqueur plus white wine makes a Cranberry Kir. 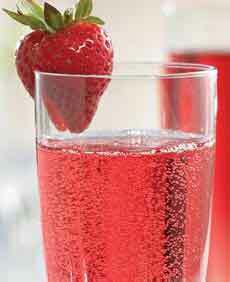 Use sparkling wine and it’s a Cranberry Kir Royale. Photo courtesy Drink Skinny. Serve responsibly! Always have attractive non-alcholic options for guests who should be cut off.